We are offering Round Stainless Steel Thali Set to our clients. 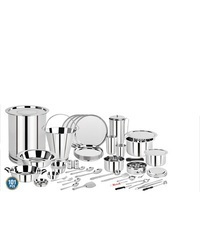 Among our wide range of products, we are offering a wide range of Stainless Steel Thali Set. How you have served a dinner, leave an everlasting memory in your guests. Stainless Steel Dinner Set offered by us in not only long lasting but also available in varies varieties and designs. Add a dash of elegance to your family dinners with one of this classic stainless steel dinner set which are a complete dining and serving solution for every home. 24 Piece SS Dinner SetManufacturer & Supplier of Dinner Set & 24 Piece Dinner Set. Our product are having range and quality .also comprises of Stainless Steel Buckets, Stainless Steel Tope and Stainless Steel Stock Pot.